The game offered the rare opportunity for the tourists to play on a turf wicket. Dragons captain Kevin Wright called number as opposed to Bauhinia and elected to bat, SCC openers Wooton and Kett took to the field for under a blue sky and much warmer temperature than a Decembers day in Shanghai. Club captain signaled his intent dispatching the third ball of the innings to the extra cover fence, before dragging on a wide half volley from Andrews on, to leave Dragons 4-1 at the end of the first over. Gary Wright came to the crease and was soon into his stride with some crisp off side drives taking full advantage of the fast outfield, with Samuel Kett playing a solid anchor role at the other end, 50 was bought up without further loss. Kett was the next man out, runout for 18 due to a slip when trying to make his ground, 59-2. Sanjay was next man and combined with Gary in a useful stand of 42 off 47 balls before Gary having completed his half century was clean bowled by Poole for 60 with the score on 101. Kevin Wright joined Sanjay at the crease, before Sanjay having got a start holed out for 21, closely followed by Kevin 1 run later C&B by former Durham CCC’s Ryan Buckley. Tsesmelis and Newton added a further 14 runs Mike being sixth wicket down, Jon having recorded Shanghai’s first maximum of the innings over the mid-off fence, was clean bowled next ball by Poole. With the HKCC bowlers now on top, some spirited resistance was shown by Imran with another maximum over cow, however Shanghai lost their last 3 wickets cheaply, to leave Imran not out on 12 with the score on 153 all out, and nine and a half overs of the allotted fifty remaining. Pick of the HKCC bowlers Isaac Poole with 5-46 off nine overs. To say defending 153 in fifty overs on a relatively small outfield, against a very strong batting line up, would be difficult is an understatement. However someone had forgotten to inform the Dragons. The Dragons opening pair of Manik and Sanjay started well but equally Poole and Watkins were in no mood to give anything away. They were starting to get on top of the rate before first change Jon Newton trapped Watkins LBW, 31-1. The skipper brought Govind into the attack and Shanghai proceeded to apply the brakes with some tight and accurate bowling backed up ably in the field, Imran took a smart catch standing up to Govind to dismiss Varley the second of three to fall him. At the halfway point HKCC were on 94-5, requiring just 60 to win, still Shanghai weren’t finished Mike Tsesmelis rearranged Andrew’s timbers with a jaffa to bring Hong Kong to 8 down and staring at a defeat which looked highly unlikely at the beginning of their innings. Ashton looked to have brought things under control before he fell LBW for a hard fought 28, with 10 runs required off around 3 overs. Buckley hit Sanjay back over his head for a couple to bring the scores level with the HKCC winning run coming from a no ball. Hong Kong crossed the line with one over and four balls remaining. Pick of the Shanghai bowlers Govind 3-16 off 10 and Mike 2-10 off 7. An enthralling game of cricket, played with impeccable sportsmanship and a fitting tribute to mark this historical occasion. Long may they continue. Both sides and officials convened on the pitch for an expert fines session run by Shanghai’s Dayne Wooton and Elliot Andrews from HKCC. Highlight off the field was the terrific dinner offered to us in the HKCC Chater Tavern, with a commemorative place mat, programme and beautifully inscribed coaster being afforded each guest. The speeches and camaraderie carried on into the night, with tales of lost iPads and the “wrong” blazers. 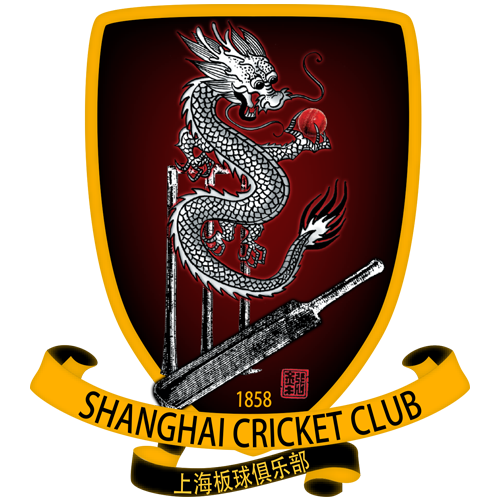 The Shanghai CC would like to extend its heartfelt thanks and gratitude to Hong Kong CC for their hospitality and professionalism which made the weekend one, which those fortunate enough to be involved will never forget.